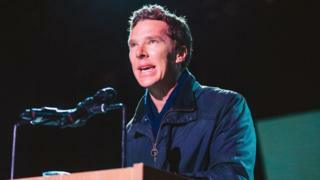 Benedict Cumberbatch, Tom Hollander and Mark Strong performed alongside a number of other actors and celebrities at a secret performance of Letters Live at the Wilderness Festival, in Oxfordshire. Letters Live involves performers reading monologues based on real life correspondence. At Wilderness the event took on a music theme with letters from artists such as Queen’s Roger Taylor, as well as correspondence addressed to the Rolling Stones. Kingsman star Mark Strong gave voice to the legendary US rock critic Lester Bang and his 1978 letter to the Village Voice, on his theories about the birth of punk music. Sherlock star Cumberbatch performed a hilarious letter written by Queen drummer Roger Taylor to Rolling Stone magazine, disputing a negative review of the band. “Your peculiar 1970 time warp attitude, coupled with an innate congenital miscomprehension of rock and roll continues to fascinate and annoy,” he read to laughter from the audience. Fresh Meat actress Zawe Ashton gave voice to a young Fijian schoolchild whose angry letter to the Rolling Stones apparently now hangs in the Rock and Roll Hall of Fame in Cleveland, Ohio. The letter was prompted by an off the cuff remark by the bands manager about the muted reception to their arrival on the island. “Just wanted you to know, me and my friends with nearly the whole school, hate you,” she began. Rev star Hollander brought roars of laughter from the audience as he faithfully quoted an outrageously graphic love letter by Country Gardens composer Percy Grainger, as florid as it was pornographic. There were some sober moments as Strong, celebrating his birthday and receiving a sung tribute from the audience, recalled a powerful letter written in 1884 from the artist Vincent van Gogh to his brother Theo. “You don’t know how paralyzing it is, that stare from a blank canvas that says to the painter you can’t do anything,” Strong read.